The PST7s are hugely impressive, smooth and clean - and the three weights will cover most styles. Great value for money. Pure, sweet tones on the crashes. Hi-hats have heaps of presence. Slight lack of timbral complexity. Paiste has always done its utmost to further the cause of the budget and starter cymbal by actually producing bargain platters that don't make you wince and itcontinues to build on this reputation with the new PST7 range. Since 2005 we have had the snappy Paiste Sound Technology, or PST lines, starting with the (recently updated) PST5 bronze and PST3 brass beginner lines. 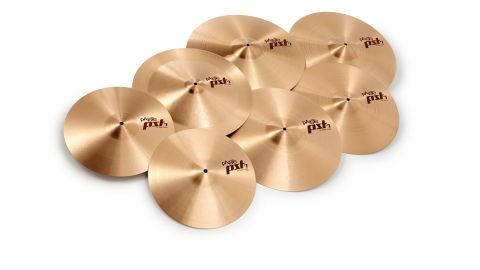 In 2012 came the rather tastier PST8s - B8 cymbals in the shiny Reflector finish. Now we have the PST7s, which are the same quality but with normal polished finishes. This is still a budget line, positioned just below the long established Alphas and professional 2002s. The key thing about PST7s (and PST8s and PST5s) is that they are crafted from Paiste's original 2002-series B8 bronze, CuSn8. Paiste was the first company to successfully make pro cymbals from this low tin content alloy and has maintained an edge ever since. The PST7s are lathed top and bottom, including the bells, with slightly unevenly spaced, machined grooves. Rides and crashes have sparse moon-crater-like hammerings. There are a couple of chinas and a splash, plus hats, crashes and rides in three weights - light, medium and heavy. "What characterises the PST7s is their sparkling clarity and smooth, clean tones"
What characterises the PST7s is their sparkling clarity and smooth, clean tones. Clarity has always been a Paiste feature, which you can either view as a plus or minus - either a purity of tone, or a lack of overtones, a one-dimensional sound. We think it works best with crashes and hats, while sometimes leaving a bit to be desired with rides. In the case of budget rides though, this is often a good thing. Complex overtones are fabulous when the resulting blend is harmonious, but not so good when it is a whining discordant racket. Which is often the case with cheaper cymbals. So in the case of the PST7 rides, the fact that they continue the clean theme of the crashes and hats is a plus. All three 20" rides are characterised by an extremely sharp stick ping and resounding full-ringing bells. The Light ride is the deepest and the smoothest, doubling equally well as a crash. The Heavy is the pingiest with a more metallic, fruity, high pitched stick sound and merciless bell. The Medium has a slightly shorter sustain when crashed, but a full-toned body to back up the stick attack, plus a good balance with the strong bell. Turning to the crashes, we can't over-emphasise the purity, the sweetness of tone. The medium 18" is warm, full and clean, similar to the classic 2002 and as good as any Alpha. The Light crashes are silvery, fast and lucid. The Heavy crashes have more volume and aggression with raised pitches. If anything, we found the hi-hats even more impressive. Although continuing the clean sound theme, all three have heaps of presence. Sometimes cheap hats (especially when lacking some sort of bottom cymbal sound edge or holes) can become weak and subdued when played closed. Not the PST7s - they dole out a meaty tick and when pedalled the 'chip' is crisp and loud. Even better, gradually opening them up for a good sloshing, the fresh quality produces a gorgeously rich surf-like wash.